One of the best features of the hosting weddings at this fantastic Georgian Bay waterfront resort is the Cobble Beach wedding ceremony lawn. This beautiful green space on the edge of Lake Huron is a draw for everyone wanting an outdoor wedding north of Toronto with the feeling of nature all around you. Though many venues throughout Ontario have a waterfront property or a lakeside ceremony space none are as beautiful as this. A golf course community which includes the 4.5 star rated Inn at Cobble Beach has 10 rooms in the 2nd floor of the clubhouse with exceptional and luxury services. The Cottages allow for many more of your guests to stay on site for the wedding day, or for many the wedding weekend. The Spa is a great place to use as your preparation room for hair and makeup and a relaxing evening before with the steam room and a massage. 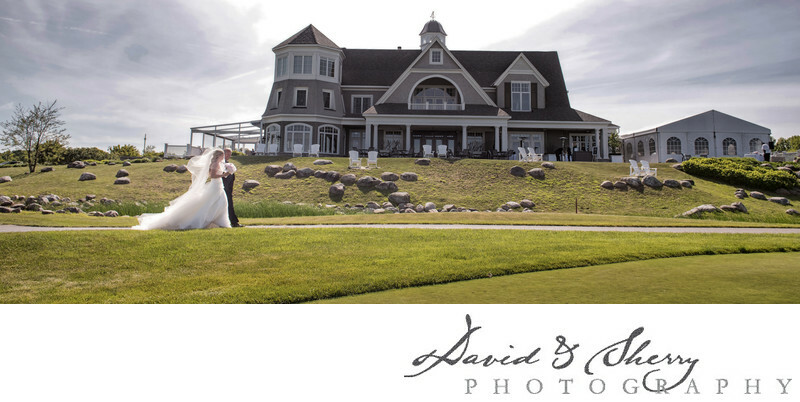 In addition to the spa, Inn, cottages, ceremony space and golf course, Cobble Beach has just completed the best event venue space on Georgian Bay. Capable of hosting up to 220 guests this window surrounded wedding venue can be the luxury place for weddings all year around. When paired with luxury decor this makes for the top place to host weddings north of the GTA. If you are looking for the best wedding venue on Georgian Bay, Cobble Beach is the place to be.